The concern is Carly might be having an allergic reaction to the CBD Oil since the rash showed up just after her last visit when her dose of CBD was "upped". Having this concern, she immediately got us in to see the allergy specialist at Children's. Not one but two doctors walk in the room. One immediately looks at her rash and says "Yes, that's a drug interaction rash" I quickly said, "No, you mean that is not a drug interaction rash". The other doctor then said it did indeed appear to be a drug interaction rash and they started talking about how to treat the rash. As they spoke among themselves in the exam room, I piped in and said, "Don't forget she tested positive for strep throat on Monday(June 8th)". Obviously, that changes the story because it adds to the difficulty investigating the cause of the rash, which is a good thing. 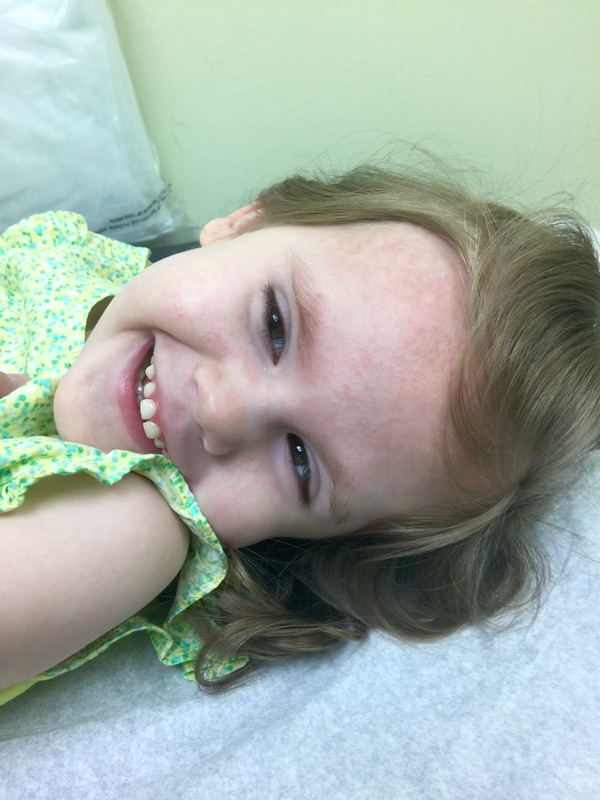 Although strep rash doesn't typically start on the forehead, they could not rule it out. Suffering from a rash is very rare with CBD Oil usage though it has been reported in a few patients across the United States. If she is allergic to the CBD Oil, she is more than likely allergic to the Sesame Seed Oil. The product, Epidiolex, suspends the CBD in Sesame Seed Oil as a vehicle to take the medicine, whereas some other products use other suspensions like Olive Oil etc. If the rash is from Strep, it should clear up in the next week. If it's not, it will either stay the same or progressively get worse. As of today, the rash is not harmful, however, I was told if it affects any mucous membranes it can be very harmful or possible fatal. Needless to say, there will be a very close eye kept on the areas to which this could occur. The point was etched in my brain when the doctors told me if it affects her mucous membrane anywhere on her body, call us while you are driving to the ER, not before you take her. It's that serious(as with any rash I am told). We have an appointment set for one week from today to see if the rash has gone away. If so, we still won't know 100% if its CBD. We will only know that if we go back up on her dose and it returns. There is no pressing need to up the dose since Carly is seeing good results thus far in the study. If it is from the CBD Oil, it will be up to the Doctors to determine whether or not she pushes through rash or is taken off completely. Many factors will come into play to make that determination. So here we are six weeks into Carly taking CBD. Seizures have become pretty much non-existent and she has seen awesome cognitive ability improvements. It sickens me to know we might have to come off the CBD. No way to tell tonight and all we can do is pray she can keep taking CBD. We have a chance there is no correlation to the oil. I personally think this is a fluke and she will continue down the path of progress. As Amy has said, maybe the rash was God telling us to take her in to see the Pediatrician on Monday only to discover the Strep Throat. He was being her voice. Otherwise, we would have never known. I wish you the best! I am following your wonderful journey! My family is so hoping the CBD oil will be available soon. Could they change the suspension oil ? They cannot change the suspension since this is the only CBD Oil approved to be given in AL at this juncture and the company won't/can't change it. Maybe one day AL will have more options, but that won't happen anytime soon. Thank you for the continued wishes. God Bless! Alabama is so slow. And why would the company not use something like Coconut Oil or Olive oil.